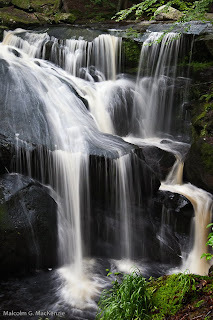 Keep it in Focus: Enders Forest Waterfalls...A little gift from God. Enders Forest Waterfalls...A little gift from God. I guess there is more than one way to look at bad weather. If you have been watching golf on TV, or trying to play golf in the Connecticut area, I'm sure you know we are having a very wet start to the summer. This is not good for golfers. If you are a photographer however, you might consider it a small gift from God. 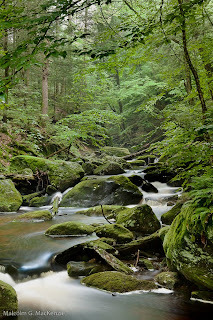 I have lived in the Farmington Valley of Connecticut for almost 50 years now and cannot remember this much water still in small streams in late June. 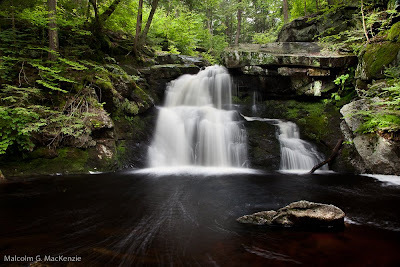 There is one particular stream, a feeder tributary of Salmon Brook in Granby, that runs through Enders State Park that has a whole series of waterfalls that are spectacular at this time. I have spent the last couple of mornings, the only dry mornings we have had all week, climbing the gullies of Enders and feasting on the views. This is not a well known park, even locally, so you don't have to fight the crowds, or clone people from you shots, if you get there early. You don't have to be there at sunrise but if you are there to photograph you should make it when the sun, or the brightness of it, is not straight overhead. If you decide to take a hike, wear good hiking shoes or boots, and be prepared to get them wet. I've been wearing my goretex fishing waders so that I can go any place in the stream that gets me the shot. A tripod is a must to as the light is low down in the gully. I'm not looking for any more rain but I hope the water flow continues for I certainly intend to keep enjoying this little gift from God for as long as it lasts. This is my first attempt at a blog. I have learned so much from others that have shared their experiences and special spots that I felt that I had to make the effort to give a little of myself in return. I hope you enjoy, please let me know. Woo Hoo!!! Your new blog looks great Malcolm! I'm looking forward to keeping up with all your great trips and photography! Love love love the first image of the waterfall! So gorgeous! Great photos! As I recall Calum and I used the same subject for our high school photography class. Imagine that.... 24-25 years ago your sons were looking through the view finder of their cameras in exactly the same spot! What a trip! Wasn't there a place you could slide down the rocks? Malcolm, these photographs really give the viewer the reason we love New England! captured them beautifully. Thanks for the eyeful! Smashing shots of the Granby area, Malcolm. I have fond memories of my Hartford Track Club days arising at my home in West Simsbury to run each morning through the McLean forests. Taking note of all your great weblog, I obtain it is of the unique topic and absolute inspiring ideas. Thank you for sharing your knowledge! Feel free to visit me back!